News & Events | . Eight thousand people, some traveling from as far as Canada, New York and Texas, came together for the 23rd Annual Chinese New Year Festival, held at Miami Dade College - Kendall campus, on Sunday, February 20, 2011. In attendance were China's deputy consul general Yunlian Xie and consuls Dong Wang and Zhihong Wang, who had traveled from Houston, Texas, Taipei's director general Raymond Mou and Jamaica's consul general Sandra Grant-Griffiths, both here in Miami, Florida, and members of the Miami-Dade County Community Relations Board. 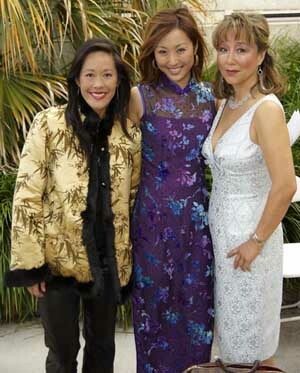 Shannon Hori, an emmy award winning CBS 4 evening news anchor and Lisa Hu Barquist, esq. and chair of the Miami Dade County Asian American Advisory Board emceed the shows. Two shows comprised of acrobatic feats, mask changing (passed down within families), taiko drumming, traditional Chinese dances along with dances bearing a contemporary flair (hip hop) entertained the thousands in the audience, standing room only. A variety of delicious Asian fare, an abundance of vendor booths offering assortments of far eastern and western goods, children's activities as well as several non-profit community organizations providing cultural, medical and social services information were experienced and enjoyed. Proceeds from the festival, organized by the Chinese Cultural Foundation (a nonprofit entity), were donated to cancer and diabetes research, Friends of the Asian American Advisory Board (awards scholarships to Asian students) and other non-profit community organizations. 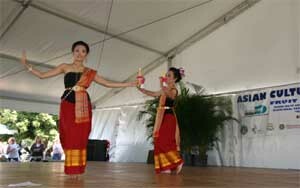 The Miami Dade County Asian American Advisory Board has supported the festival since its inception over a decade ago. This year, the city of Tel Aviv-Yafo celebrates its 100th anniversary. Located on the beautiful Israeli Mediterranean coastline, Tel-Aviv is the second largest city in Israel. The first modern Hebrew city, Tel-Aviv was founded on April 11, 1909. On that day, several dozen families gathered on the sand dunes on the beach outside Yafo to allocate plots of land for a new neighborhood they called Ahuzat Bayit, later known as Tel Aviv. The city expanded rapidly with massive waves of immigration in the 1920s and 30s, also bringing about a boom in Bauhaus-style architecture. Tel Aviv's status as the region's most creative, liberal and tolerant city received was furthered when Yafo joined the municipality in 1949. Throughout the decades, the city has flourished to become Israel’s business and cultural center and has developed a unique atmosphere fusing Mediterranean and urban elements. Tel-Aviv’s beaches, bars, cafés, upscale shopping, great weather and cosmopolitan lifestyle have made it a popular tourist destination, and given way to its reputation as "the city that never sleeps”. A wide array of events are being held for the centennial celebrations, including outdoor festivals, art shows, sporting events, historic exhibitions and numerous community projects, among others. Celebrations started in early April this year, marking the date of the city’s founding 100 years ago, and will continue through 2009. Special events celebrating the spirit of Tel Aviv-Yafo will also be held in cities around the world, such as New York, Vienna, Copenhagen and Paris, with creation of Tel Aviv beaches in Central Park and along the banks of the Seine, the Danube and Copenhagen's canals. Sunday, April 11, 2010. The rain didn’t stop the meeting of many members of the Homestad and Florida City community. They meet at the Farm Workers Association of Florida to talk about the increase of the f kidnapping and disappearing of immigrants on nighttime as a Gestapo style tactic of ICE. The Migration department is not respecting the laws of privacy and security of a person. Neither the ICE nor the police are respecting the USA constitution. The meting talk about how the Police actually come into your own house. During the questions and the answers, the community agree with the commitment of announce to others organizations about the ICE actions. Most of the people leave the place really happy with the first of what will be the start of regular Farm Workers Association meetings. It is necessary that the Homeland Security take the responsability of watch out closely the people who is working for them. The ICE officials have a evil history where they has no respect for kids, adults, they deal brutaly and freak out to everybody. To truly experience another culture, one must travel to the country and live as the locals do - enjoy the delicious food while discussing the mundane and the extraordinary with the locals on their native soil. The next best way to experience the same is through quality cinema which instantly takes us to another country, letting us experience that which is universally common to all while enjoying and respecting the differences amongst us. Visit and learn about the countries and cultures of countries in Asia through the Asian Film Festival this year. The Community Outreach Committee was formed to proactively engage the Asian American community to educate the public about the goals and work of the AAAB. To that end, the Committee works with governmental entities, educational institutions, local hospitals, and other Asian organizations to further the Committee’s goals. The Committee will have informational booths at various events and festivals throughout the year and will speak about the AAAB at other events where the AAAB is a sponsor or where the Committee is invited. The Asian American Advisory Board congratulates the Iranian American community for being the recipient of the Most Outstanding Cultural Exhibition at the 20th Annual Asian Cultural Festival held during the weekend of March 6 & 7, 2010 at the Food & Spice Park in Homestead, Florida. The Iranian cultural exhibition tent was beautifully decorated with many cultural artifacts and displays, including multi-media presentations of Perespolis and the ancient civilization of Iran. Throughout the Festival, there were musicians playing two unique Iranian musical instruments, the Sehtar and the Santor. Additionally, the tent displayed a beautiful Haft-Sin, which is a traditional spread featuring decorated items for Nowruz, the Iranian New Year. Many Iranian American organizers inside the tent were dressed in traditional Iranian folkloric clothes. There was also a group of Iranian dancers from Washington, D.C., who performed traditional Iranian dances on the main stage, which pleased the crowd in attendance. This was the first time the Iranian American community collaborated with the Asian Cultural Festival of South Florida. The AAAB held its ten year anniversary celebration at the luxurious Mandarin Oriental - Miami Hotel in September 2008. Three hundred fifty people attended the black tie dinner gala, including Miami Dade County Commissioners Bruno Barreiro and Katy Sorenson, U.S. Attorney Alex Acosta, and Consul Generals from Israel, Japan, and Jamaica. Key note speakers S. Floyd Mori, National Director of the National Japanese American Citizens League and Karen Narasaki, President and Executive Director of the Asian American Justice Center, both traveled from Washington D.C. to Miami to participate in the event. During dinner, slides of Asian countries and peoples were displayed on the large screen and a fashion show of many colorful Asian costumes were modeled. Mistresses of Ceremony were local news anchors Amara Sohn and Shannon Hori, with channels 4 and 6. 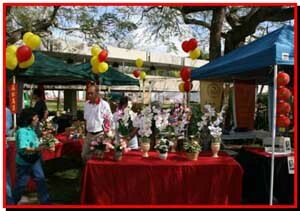 On a breezy, temperate Sunday in early February 2009, 10,000 people attended the 21st Annual Chinese New Year Festival held at the Miami Dade College - Kendall Campus. People came to watch the entertainment, taste the varied and delectable foods, and buy Asian products. The lion and dragon dance opens up Chinese celebrations to bring in good luck and prosperity. The New Year is one of the most important celebrations for Chinese - it signifies a new beginning; it is a time for reunions with family and friends and to give thanks for what has transpired the previous year and to welcome a new year. Legend has it that Buddha had asked all the animals to meet him on Chinese New Year. 12 animals came and Buddha named a year after each animal and people born in that animal's year would have traits of that particular animal. 2009 is the year of the Ox. Those born under the Ox are loyal, fearless, hardworking and friendly. President Obama was born in the year of the Ox. For Oxes in 2009, any setbacks and obstacles will be overcome. 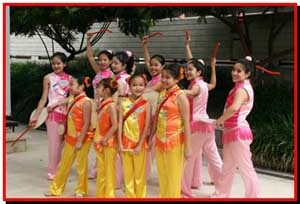 The Annual Chinese New Year Festival hosted two shows displaying the athleticism, musical talent and beauty of Asia. CBS news anchor Amara Sohn along with AAAB Board member Lisa Hu Barquist emceed the shows. Council General Yamaguchi returned to Japan after completing his assignment as Japanese Council General in Miami Deputy Council General Naohito Watanabe will succeed him as interim Council General. Mr. Yamaguchi was great friend of the Asian community, during his tenure the Japanese Consulate very actively participated in community activities, especially the Asian event. 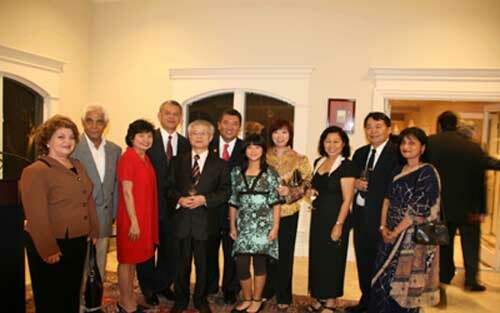 He often invited Asian community leaders to his residence to plan and participate in the Asian activities. Asian community leaders expressed that he will be missed, and wished him well on his new assignment.Council General Yamaguchi completes his term in Miami. 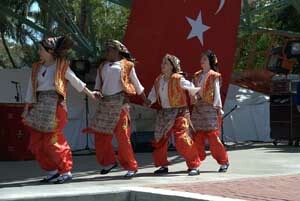 Anatolia Cultural Center, which represents Turkish-Americans living South Florida, brought a world-wide event to Fort Lauderdale's Huizenga Plaza on Sunday, April 19th, 2009. Near 7,000 South Floridians were treated to an incredible event featuring beautiful costumes; heart simulating live music and amazing sight of the most diverse dancing on stage as well as to various art craft and delicious food from Turkey. The Ottoman Amy Band, "Mehteran", came all the way from Turkey and showcased their marches, costumes and dances that have been around since 13th century. The Blue Star Folk Dancing Group presented a variety of Turkish folk dance pieces from traditional dances to modern choreographies keeping the spirit of the dance. The crowd was cheered with the heartwarming speech of Mr. Mitch Ceasar, the chairman of the Broward Democratic Party. When the Asian colors float over the waters of Biscayne Bay, it presents the most spectacular mix of Asia and South Florida-dragons, water, sand and palm trees. Economically, it is the most powerful event. According to Joe Chi, President, Miami Hong Kong Dragon Boat Festival Miami World Corporate Community Dragon Boa Championship, the estimated impact of this years -ship Race which was Combined with a National Open Water Swimming Championship, wakeboard waterskiing, skate boarding and other activities were better than usual in spite of a troubled economy. With over 800 dragon boaters, over 1000 swimmers and 20,000 spectators over 4 days we estimated an impact of close to 2 million dollars on the Miami Dade economy. This was estimated by multiplying 22,000 persons by a $100 basis figure. During the first weekend of March thousands of people invade the 35 acres of serene Fruit and Spice Park to celebrate the Asian Culture Festival. 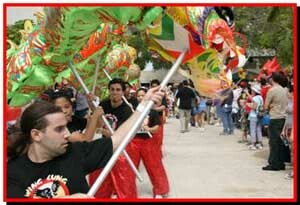 It is the largest Asian festival, which draws approximately ten thousand fans from across tri- county area. It highlights the cultural diversity of Asia. A large number of Asian Consulates and local organizations representing various Asian countries set up education booths showcasing their respective countries. It offers a program full of Cultural performance by supple acrobats to passionate Taiko drummers; a fashion show with attractive models presenting colorful traditional Asian costumes. This event attracts two hundred plus vendors merchandizing, Asian art, craft, jewelry, and costumes; tropical plants and fruits; and variety of Asian cuisine. A large number of out-of-town performers contribute to Miami Dade County economy. It is estimated that this event generates close to $400,000 in sales, park fee, hotel rental, and taxes, insurance, and cost of other services. It brings a much needed income to several small businesses who set up their shops at the event. 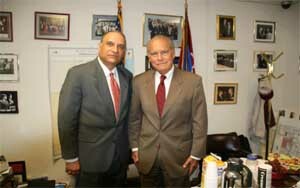 On May 19, 2009 Chair, Dennis C. Moss hosted a Recognition Lunch at the third floor County Commission terrace. This marked the beginning of a new engagement between a ranking elected officials and the Asian community. At this occasion Commissioner Barbara Jordan presented a proclamation to the Asian Board. Commissioners Audrey Edmonson, Sally Heyman, and Javier Souto were also in attendance. At this event Chairman Moss recognized the planners and organizers of the Asian Heritage Month representing the U.M. Miller School of Medicine; the Jackson Healthcare System; Miami Dade College and Miami V.A. Medical Center. Many in the audience thought that this activity has the potential to become an annual ritual. On Saturday, June 27, 2009 UHI Medical Clinic held a brunch meeting at the Clinic attended by State Representative Oscar Braynon and City of Miami Gardens Mayor Shirley Gibson and a number of Asian community members. At this occasion the Mayor Gibson and Representative Braynon dedicated a plaque to recognize a generous donation to Clinic by Fauzia and Mohsin Jaffer Foundation. The foundation donated $18,000 for seed money and later for operational funds. 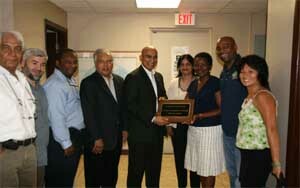 Mayor Shirley Gibson of City of Miami Gardens is presenting the plaque to Dr. Mohsin Jaffer. The month of May is the season to showcase the Asian Heritage in our community. Again, this year, the Board collaborated with Miami Dade College, Miller School of Medicine, Jackson Healthcare System and Miami V.A. Medical Center. Bill Simonitsch, Esq., an Asian Board member was the keynote speaker at V.A. 's main event on May 27, 2009. In his speech, he highlighted the Asian diversity, contributions of the Asian Americans to American society, he focused especially on the military contributions. He shared their valor in various, pointing out the Medal of Honor winners and reminded them that current V. A. Chief is also an Asian American-General Eric Shinseki, Secretary of Veterans Affairs. Shawn Khosravi, Miami Dade County Asian American Advisory Board's Chair is on a whirl wind schedule to meet all County Commissioner. He is visiting to keep them informed about the Board's progress, Sharing the accomplishments and projects Board plans to undertake in the future. He has also solicited their support for the Friends' scholarship project that plans to grant twenty scholarship during its first Award ceremony on November 1, 2009 at the Storer Auditorium, University of Miami. Mr. Khosravi also shared with the Commissioners the Board desire to collaborate in projects of mutual interest in their respective Districts. During the month of June, He met Commissioners Sally A.Heyman, District 4; Bruno A. Barreiro, District 5, and Javier Souto, District 10.